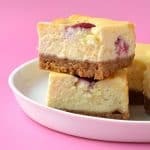 Deliciously rich and creamy White Chocolate Raspberry Cheesecake. Preheat your oven to 160 C (320 F). Grease and line an 8 inch square pan with baking or parchment paper, ensuring two sides overhang. Add cream cheese to a large mixing bowl and beat until smooth and creamy. Add caster sugar and vanilla and beat again. Then add your eggs, one at a time, until combined. Add sour cream, white chocolate pieces and fresh raspberries and stir until smooth – but try not to over mix. Pour your cheesecake filling over crust and smooth over the top. Bake for approximately 40-45 minutes minutes or until it no longer wobbles in the middle. Try not to over bake it as it will continue to cook as it cools. Leave the cheesecake in the oven with the door ajar (with the oven turned off) for at least one hour. Remove and leave to cool slightly on a cooling rack before transferring to the fridge. The cheesecake is best left in the fridge for 3-4 hours (or overnight) until it cools completely and becomes nice and firm before slicing.